I’m lucky to have an absolutely wonderful car museum close to me and this is the Sarasota Classic Car Museum in Sarasota, Florida owned by good friend Martin Godbey. Last year during one of my visits, I had a chance to learn more about some of the more modern cars in the collection and to my surprise I found the subject of today’s story – the 1999 Ford Thunderbird Concept Car – created in fiberglass. But I shouldn’t have been surprised. A number of the designers and builders who are part of our glass gang – and new friend Leon Dixon too – have shared with me that manufacturers would ramp up a concept in ‘glass due to the speed and cost savings of doing the same when compared to aluminum or steel. 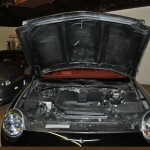 Fiberglass would be the material of choice for building a concept car from the early to mid ‘50s through today. And that’s what we have here. 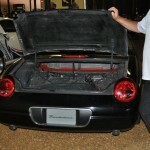 Let’s review the story on this car and some photos too. The Thunderbird concept evokes memories of the original classic Thunderbirds of 1955-57. It should. The designers had examples of the ’55 and ’57 on hand during the design phase. Like the original, the new design was done by a dedicated group within Ford, outside the usual channels. In 1953 clandestine work was made official when the Corvette was introduced. 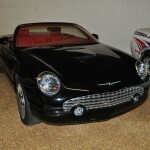 The Thunderbird was introduced in only six month, thanks to the unofficial work that had gone on before. In 1997 the Thunderbird was dropped, but some at Ford felt that the heritage of the car should be kept alive. Their enthusiasm convinced the head of Design to authorize the project. 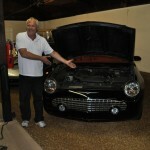 The choice of a chassis was the Linoln LS, modified to retain the long hood look of the original Thunderbird. A design feature taken from the original is a hood line higher than the rear deck, the opposite of the current wedge shape. Three concept models were built. One was converted into another concept, Ford Kept one, and the third is here on display. Its wheelbase is one inch longer than the production car, the body is fiberglass, and it carries a unique color combination. Production cars went on sale in late 2001. Thanks goes to Martin Godbey and his team which includes Don Walters, Nathan Clary, and sometimes Martin’s son Blake too. Each of these folks and the staff at the museum have been great support and help with our car stories in every way. And…it’s the Sarasota Classic Car Museum where you can see our 1961 Covington Tiburon Coupe, the 1955 Californian, our 1946 Bill Burke Belly Tank, and other cars on display too. A great museum and fantastic group of people. * New Feature: To post your comments and thoughts about this story, scroll down the page and post your information in the section titled “Leave A Reply.” Your name and e-mail address will be required, but only your name will appear – not your e-mail address. 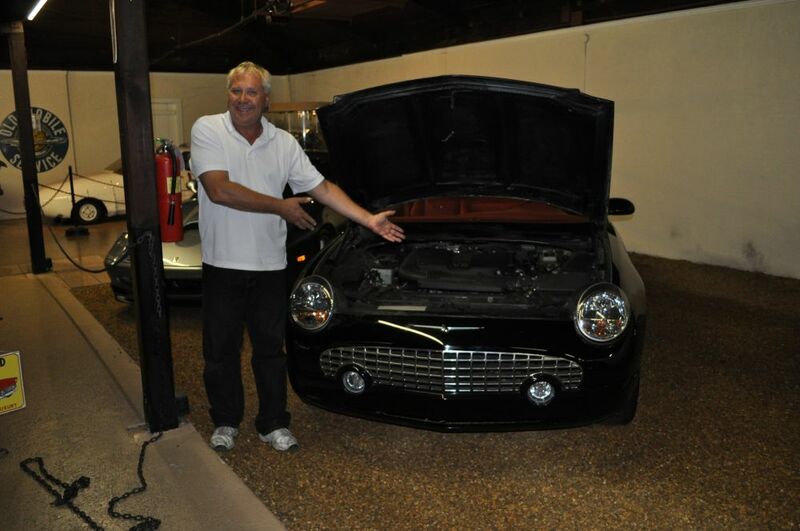 * Click here to visit the Forgotten Fiberglass Forums and post your thoughts about vintage fiberglass cars. * Don’t Forget: We appreciate any and all donations to our Forgotten Fiberglass website. Your donations help defray production costs. To make a donation, look for the “Support Forgotten Fiberglass” box at the bottom right of our website and click on the word “Donate”. 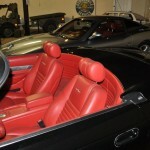 All contributions help make “Forgotten Fiberglass” the best it can be. I saw this car in Arlington Heights, IL when Ford was showing it before the real one was introduced. Too bad Ford did not keep the red interior of the prototype. 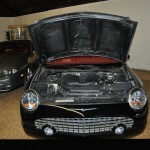 This is just one of many things that Ford did wrong with the new production Thunderbird. I Saw this car last October in Sarasota. I believe the car is being sold on Bill of Sale only. I understand that this car has a governor or some type of limiting device that will allow it to go only 15 mph. The price tag on this car is a bit high at $200,000 or so. 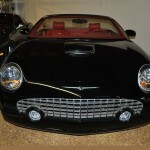 In the early 1950s when Ford began planning the first Thunderbird they bought some foreign sports cars. One was a Ferrari. 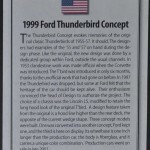 It is surprising how much of the ‘feel’ of that car returned in the 1990s edition of the T-bird. 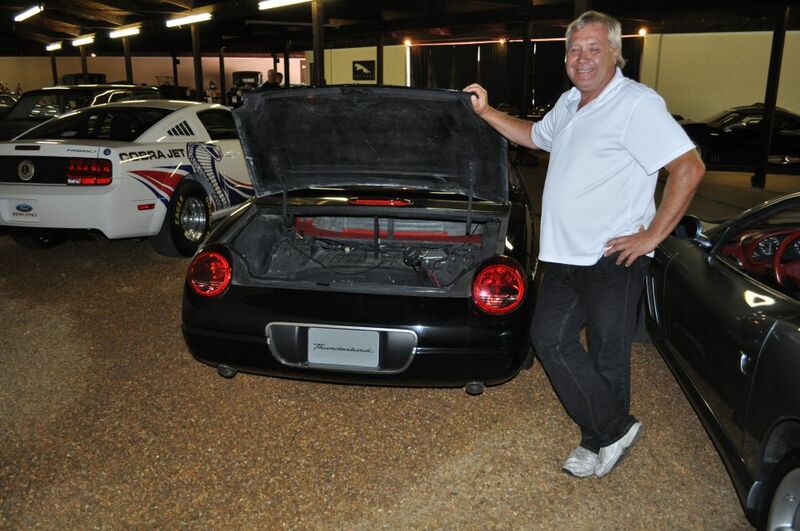 A friend in Golden Colorado bought the Ferrari when Ford was finished with it. In those days the early 50s Ferraris sold for less than $10,000. So far as I know it survived. It was a one-off model. Ford hired one of the major Italian studios to design a 1955 Thunderbird. It looked too much like a Ferrari so Ford didn’t consider it. I believe it was only a clay mockup.